Home Startup -Top Fintech What to Expect with International Money Transfers in 2018? A report on CNBC indicated that TransferWise generated substantial revenues for the year ending March 31, 2017, and it was targeting precisely the same performance for the year ending March 31, 2018. The chief financial officer of TransferWise, Matt Briers was confident that the company can continue to remain profitable and expand operations in 2018. For the year ending March 31, 2017, the UK-based money transfer company generated revenues of £67 million – double the revenues generated in 2016. The CFO of TransferWise did not indicate what type of profits the company expects to generate in 2018, but he stated that similar growth patterns will prevail. As one of Europe’s leading FinTech companies, TransferWise is now valued at around $1.6 billion. Clients can perform international money transfers in multiple currencies, sans all the high fees, costs and commissions that are applicable to bank transfers. Now, major industry players like Western Union are also fighting for their slice of the proverbial pie after losing their exclusive status as alternative #1 to the banks. Global remittances (payment transfers) are a big business. The top industry leaders in this realm include companies like Azimo, TransferWise, Ripple, MoneyGram, WorldFirst, TorFX, Currencies Direct and OFX among others. 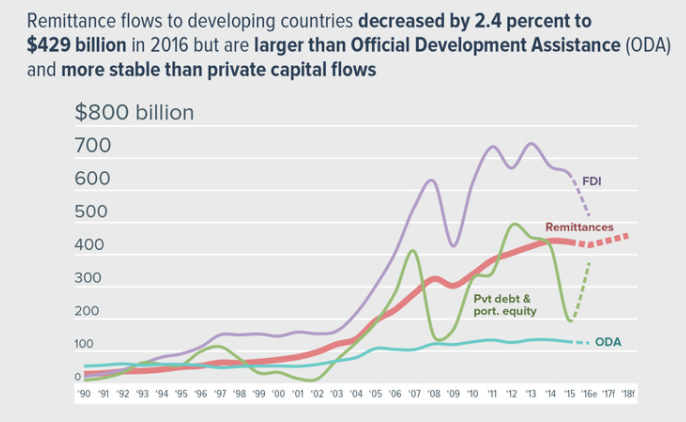 According to the World Bank, the total value of remittances to developing countries in 2016 was $429 billion – down from $440 billion in 2015. Transfers to first world countries have also declined in recent years but remain substantial at around $575 billion (2016 figures). At that time, it was a weakness in commodity prices such as crude oil that had a curtailing effect on global remittances. Oil prices have subsequently rebounded, as WTI crude oil and Brent crude oil prices are now in the $60 – $70 per barrel range. Companies like Western Union are feeling the pinch from FinTech operators like TransferWise. Owing to this increasing pressure, Western Union is now implementing expansion of its mobile payment sector for its Canadian customers. The money transfer app which is available to US customers is now created for Canadian customers too. Once it is up and running, clients will be able to transfer/receive payments in more than 200 countries around the world. International mobile payments processing is the way of the future for these money transfer companies, and it is growing at a rate of knots. For 2018, all signs are positive. According to the latest report from the best providers 2018 awards, the top-ranking money transfer company for the year to date is WorldFirst. This highly respected international money transfer organization allows minimum transfers of £1,000/$1,000/€1,000. It currently supports 121 currencies and has offices around the world. With a rating of 97.8% among users, it is both credible and prestigious. There are many checkmarks that money transfer companies must comply with, including service quality, reputation, pricing, currency supported, optimized payments, best exchange rates etc. A stabilizing global economy is evident in the US, the UK and across Europe. The GBP/USD is back at its 1.40 level (pre-Brexit level), the US dollar is down 2.89% for the year, which is good for commodity prices, and US employment is at an optimal level. With all the proverbial ducks lined up in a row, 2018 is expected to be a bumper year for global money transfers. Customers have wised up to the high exchange rates and fees charged by banks and are likely to turn to FinTech organizations for their global remittances.